This well-preserved stele of impressive dimensions and with a rich iconography once graced a niche on the external wall of a Digambara (‘sky-clad’) Jain temple. The Digambara association of the stele is evident from the three Jinas in the upper part who are portrayed naked. The central figures of such steles showing a family group with a couple and one or more male child (see Pal 1994, cats 58-59) have been identified in the past as ‘Parents of Jina’, but such an identification is dubious. They are really representations of the tutelary ‘yaksha’ couples who are subordinate to the Jinas but play an important role as facilitators between the devotee and the non-existent Jina. As a pair, they are the Jain counterparts of the Buddhist Jambhala and Vasudhara, and the Hindu Umamaheshvara or Somaskanda (cat. 52). The imposing, regal pair sit gracefully like royalty below a very stylised tree which probably represents the ‘kalpavriksha’ or wish-fulfilling tree. The right hand of both makes the gesture of fearlessness (‘abhaya’). 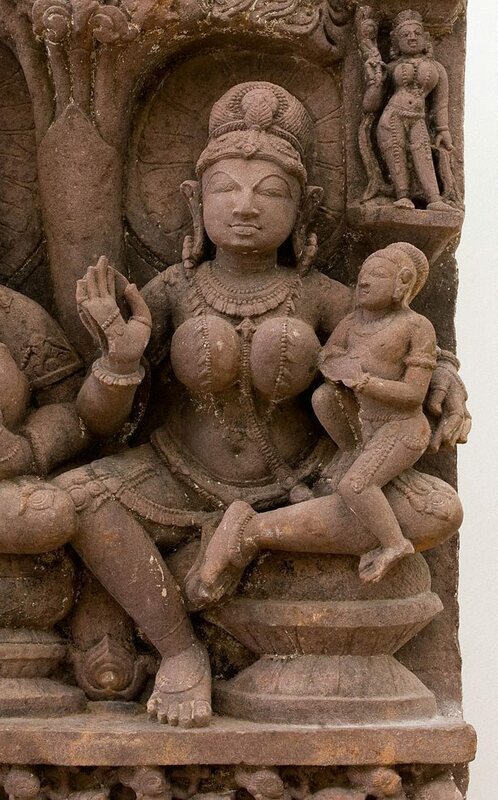 While the male’s left hand sports a jumbo lemon (‘vijapuraka’), the female supports an adolescent boy on her thigh whose hands touch her left breast. 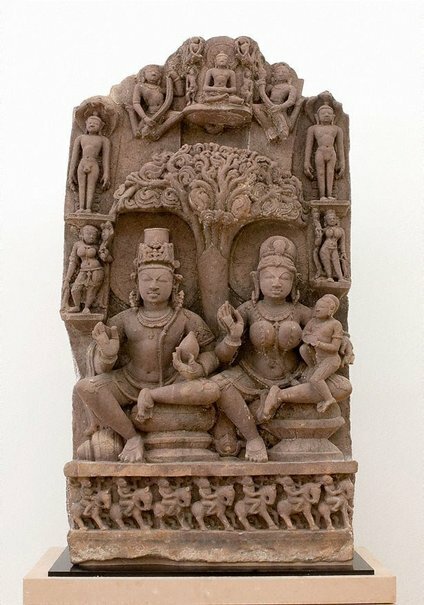 Had this been a Shvetambara (‘white-clad’) stele, the pair could have been Gomedha and Ambika, who is always depicted with child. However, apart from the relief’s Digambara affiliation and the absence of the obligatory mango fruit either above her or in her hands, the couple should be identified as Sarvanubhuti and Kushmandini (=Ambika, the nurturing mother goddess in Shvetambara pantheon), the ‘yaksha’ attendants of Neminatha. Neminatha therefore would be the Jina seated at the apex of the stele adored by celestials (see Pal 1994: cat.31). This would explain the procession of horse riders along the bottom, an allusion perhaps to the wedding procession in the Jina’s legendary life. An additional iconographic detail in this composition is the pot lying on its side beside the right foot of Sarvanubhuti. Generally, such a pot is associated with the ‘yaksha’ Kubera who is also the dispenser of wealth. 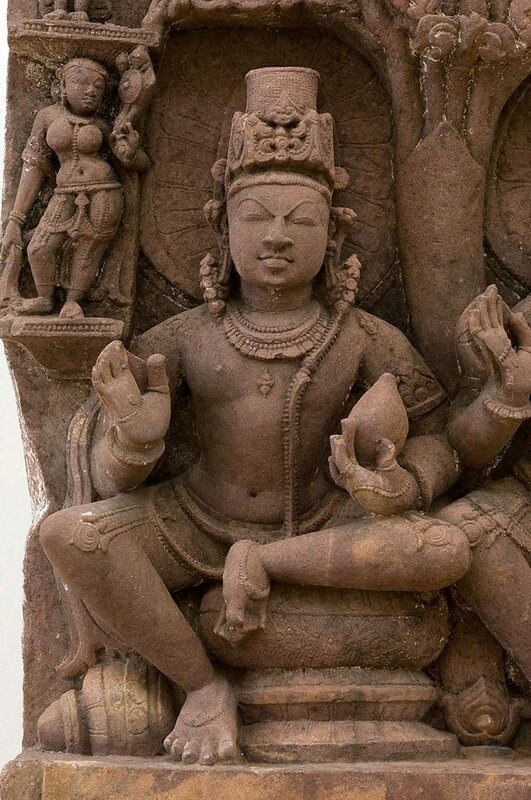 The two standing Jinas along the side in the upper section – each with three-headed serpent canopies – are the Jinas Parshvanatha and Suparshvanatha. 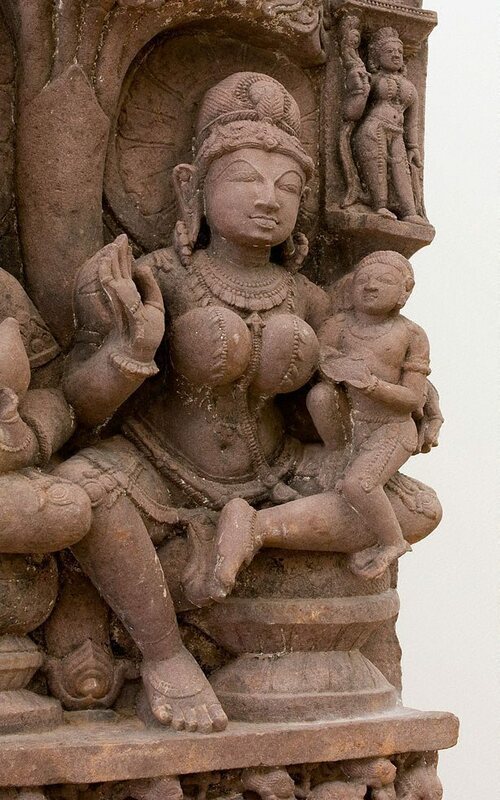 Thus, perhaps just as Kushmandini is identified with Ambika, the ‘yaksha’ may symbolise wealth. It is true that such compositions are dominated by the male of the species: all five celestials surrounding Neminatha are male. But below the tree, and at the terrestrial level, the female predominates, for both attendants along the side are female. Moreover, it is noteworthy that the two principal figures are of the same size, as is generally the case in such Jain representations, symbolising gender equality. Pratapaditya Pal, ‘Goddess: divine energy’, pg.30. Simon Ray, Indian and Islamic Works of Art, Mar 2003-Sep 2005, London/England, offered at Sotheby's New York, Indian & Southeast Asian Art Auction, 26 March 2003, lot 98. Purchased by the Art Gallery of New South Wales, Sydney, 2005.